We Could have had a Sax playing Pope called Oscar!! Rodriguez is the cardinal with sax appeal — a charismatic and charming figure who plays saxophone and piano, presents superbly on media and is one of the most ardent and persuasive advocates for social justice inside the church. Since 2007, the Salesian prelate has headed Caritas, the church’s aid arm, and has represented the church to the International Monetary Fund and the World Bank. A courageous critic of the drug trade in Latin America, his life has often been threatened. Rodriguez’s criticism of the effects of capitalism and neo-colonialism will impress Third World Catholics and Western progressives, while his conservative theological stance would recommend him to traditionalists. He is respected as an administrator, though he has virtually no Vatican experience — possibly an advantage, for the first time — and admired as a pastor, though he lacks parish and diocesan experience. He has been called a Latin American John Paul II for his breadth of vision. The Farmer With The Horn first gig with a new covers band Savvy on Sat 9th 2013 at the aptly named The Rising Sun.He blows a warm melodic tenor sax and this is one of his goals when he first came to Blowout Sax. THE VIVITONES project was born with a very specific aim. 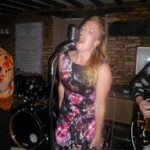 It is a six-piece fronted by a terrific girl singer that I refer to as our “Shantoose” (chanteuse). She’s a striking girl in her twenties, possessed of a voice that you’d swear belongs to someone black,fat & middle-aged! Backing her will be guitar (me & I’ll sing a bit), The Big Sleep on bull-fiddle, Phil Jones on drums (amazing player) and the new tenor man/girl which we seek. I may add piano and we have a alto-man who is not yet a lead player. I’m in my 50’s, the others are early 40’s-ish. The brief is that the band plays in an authentic post-war, pre-Beatles style. The initial repertoire is mainly interesting – some obscure – covers that I’ve selected which include Swing, Jump & “Willie Dixon” blues, early Rhythm & Blues, Rockabilly, Western Swing and good old Rock & Roll. We aim to please serious dancers on the Swing & Rockabilly scenes in the UK & Europe as well as a Lay audience. We’re featuring numbers by Wynonie Harris, Ike Turner, early Etta James, Ruth Brown, Tiny Bradshaw & – of course – All Night Long! I can burn & send a CD of material if needed. We like to add a touch of swing into any of our numbers. J D McPherson is a good example of where we’re at – check out his NORTH SIDE GAL on youtube. Our tenor player needs to embrace the band’s look, sound, style & ATTITUDE which is AUTHENTIC vintage; nothing retro, patiche, tougue-in-cheek or “reminiscent of” we want audiences to believe we’ve stepped out of a classic Film Noir circa 1953! 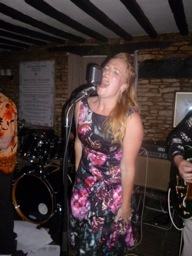 We use real or re-issue vintage gear and have excellent PA & lighting that can do from a corner of a bar to 500 people. We need someone to become structural integral member who will rehearse, hold down the horn end and contribute to arrangements of original material. An ability to double on harp would be good. The Vivitones needs to be his/her only or main band and be able to give the committment. We have 2 warm-up gigs lined up for 1st. June & 3rd. August and are planning on getting cracking on rehearsals by 1st. May latest. We rehearse chez-moi which is 5 minutes north of J.18, M4. So, if you know of a hep cat, rockin’ dude or kitten that looks the part, can wail, honk & squeal and play harp – or who wants do be all those things, let me know. If someone’s not quite there yet and maybe they can make the step-up with The Vivitones, then that’s cool too. In late November last year I got a phone call asking me how much I’d charge to play two gigs with a The Rolling Zones, a Devizes-based Stones tribute band. I will admit I’ve played with a couple of other Stones tributes but that was over 3 years ago, and for one reason or another I had not played my sax since. Add to that, the fact that I have traded in my alto for a tenor, and would have to relearn about solos or riffs, so I agreed! What a challenge – I had 17 days to get my chops into action. Day one: couldn’t get a note out of the damn thing for about 5 minutes. Tried a softer reed and told myself to get a grip! After twenty minutes I got that feeling that the muscles in my mouth had resigned. Day two: managed about 40 minutes, and some of it was sounding OK.
By day 5 I was up to 90 minutes and things were starting to change. The change was that everything hurt, including the inside of my face, and my wife was starting to make some ominous noises herself. By day 10 the panic was at its worst. I knew the melodies but my brain refused to help move my fingers in any coordinated fashion so that I began to get the feeling I was going backwards. Now luckily at this point I had a complete week without any other distractions (e.g. paid work) so I could ratchet up the practice time to about 3 hours a day. Sorry neighbours, but this is business! And by day 14 I was getting somewhere. Not as far as I would have liked, however. Could I get anything above top F? Not a squeak! Actually that’s not true – a series of squeaks was all I could get. So I went to see my friend Ray Colomb in Corsham, a fabulous sax player I have known for years, and who not only plays but repairs saxes. His conclusion – “you need more time to get your chops around these”. Thanks a lot! But he did show me an F# button that I hadn’t hitherto discovered, and so I resigned myself to accepting that for now I could only use a limited range. Too bad that Brown Sugar needs a top A. I’ll have to make up the difference in beers for the band. Anyway, the first gig came and went in a daze – a lovely private party in deepest Hampshire – and I had a further 6 days to try and reach top A. But it didn’t happen. In fact, despite my vow never to let a day go past without practising, I still can’t get it consistently enough for a live performance. And then the second gig – Corn Exchange at Devizes. 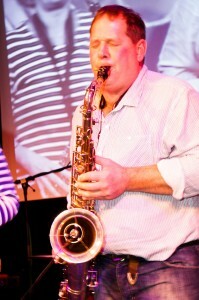 Fabulous night, great band, sax player enjoyed himself immensely and got paid! I’m now in the mood for more. So any Stones tribute bands out there who need the occasional tenor sax player just call the lovely Mark at Blowout! He knows where I live.